Do You Have Trouble Finding Enough Time In The Day? If you find yourself complaining too regularly about ‘pressure on your time’, it may be the moment to step back and try to interpret this repeated signal that seems to be flashing up an alarm. Usually just means time is controlling you. The popular phrase ‘not enough hours in the day’ is a particular giveaway. You definitely need reminding that all hours aren’t equal. They vary widely in their effectiveness – so much so, that time management has become a formal study, keenly encouraged in corporate life. One half of time management is just ordinary good housekeeping. You look around the office and find a lot of ways you can achieve small-time savings. The coffee-machine could be closer to where most people sit, allowing shorter journeys. Those big files could do with a bit of sorting out, to speed up the routine paperwork. Maybe put up a notice discouraging long phone calls, etc. No doubt this all adds up. But the other half of time management focuses right in on the dynamics of time itself. And under analysis, you find that there are two completely distinct kinds of working time, which literally fight. One of them is control time, where you control the duration of the job. The other is response time, where you react to interruptions which control you. Let’s take a typical example of control time and response time in conflict. Two managers are working separately on a major report, which requires concentration, but are also having to allow time for dialogue with the rest of the department. One of the managers Jerry puts in half-an-hour on the report, then his concentration slips, so he takes a break by ‘doing the rounds’. Someone needs a problem sorted, which unexpectedly takes half-an-hour. So it’s at least an hour before he is back at his desk. Ten minutes later, the boss rings to fix a meeting for sometime that day. “How about now?” he answers. The other manager Michelle, faces the same situation, but handles it differently. She rings one of her department, to say she’ll be doing the rounds in half-an-hour, knowing that she’ll need a break by then. During her tour, one team-member has a problem that needs fixing. “Come and see me in half-an-hour, when I’ll be ready for another break” she says. They duly fix the problem, which also takes half-an-hour. Ten minutes later, the boss rings her too, to fix a meeting for today. “How about half-an-hour’s time?” she says, and returns to another focused session on her report. The difference is that Jerry has only spent the first half-hour in control time, while Michelle has managed to arrange three half-hour sessions in control time. 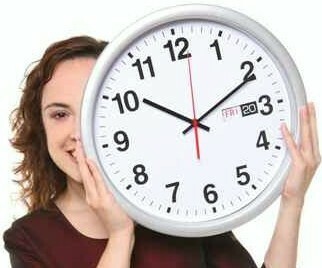 So ‘not enough hours in the day’ usually just means that your time is controlling you, rather than the other way about. In fact, experience shows that your time will automatically try to control you, unless you actively prevent it. In other words, time management has a lot to do with showing time who’s boss. Key points in Managing your time. Not enough hours in the day’ often signals, 1. Poor time management. 2. Distinguish between the time you control, and the time that controls you. 3. Good time management is increasingly at the heart of enterprise culture. Previous story Ever Heard Of Zero Risk Investing? This is my favourite line: time management has a lot to do with showing time who’s boss. I’m THE BOSS! I am in the process of trying regain control of my time and my focus. I Googled “finding enough time” and your post came up. Very appropriate. I am taking the step of creating a daily mode of operation list that will keep me focused on the different responsibilities that I have in my life and work. I a sole practitioner that works from a home office and FOCUS is the name of the game!